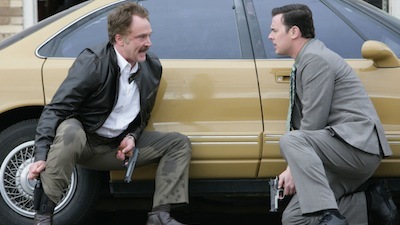 Old-school cop Dan Stark and modern-day detective Jack Bailey expose the big picture of small crime. Pursuing a routine investigation of a stolen humidifier, Jack and Dan are inadvertently thrust into a much larger case involving drug smugglers, hired assassins and a stolen green golf bag. Reminded of the way he busted punks back in the good old days, Dan convinces Jack to go along for the ride, and in their reckless pursuit of justice, the two wind up risking their lives, breaking a flurry of department regulations and reminding their boss, Lieutenant Ana Ruiz, and Jack's ex-girlfriend, Assistant District Attorney Liz Traynor, why these good guys will be spending many more days investigating seemingly minor crimes. Durante un'indagine di routine, i detectives Dan Stark e Jack Bailey incappano in un crimine di entità maggiore che coinvolge un gruppo di trafficanti di droga, dei killers a pagamento e una sacca da golf piena di contanti. I due vengono rilevati dal caso, ma Stark convince Bailey a proseguire le indagini per conto proprio infrangendo le regole.